Gear seems to be one of the top barriers for new photographers. "If I just had that light, that lens or that high end pro body, then I would be a better photographer." Gear can make a difference; however, don't let it be a barrier in your photography business. Do the best you can with what you have or can afford. It's true that you may have to invest in lighting if you want to do studio style headshots or other work using strobe lighting, but you can use manual speedlites or low end wall socket strobes initially if you have to. At $500 per head, a 640WS Einstein may be more than you can afford initially. You may find this post on studio lighting helpful which will give you some things to consider about lighting. It's true that I shoot with nice gear these days, but I can assure you that I didn't start out that way. I started getting paid as a photographer over 30 years ago and did what I could with what I had. Even my next step up to studio lighting was a Novatron power pack kit back in the 80's when other photographers were using Dynalites (still around today). Yes, it's ok to dream and make your wish list, but you have to start with where you are and what you have or can afford: No matter what level you get to, your gear list will almost always be never ending. So take action, work with what you have and only upgrade to what you can comfortably afford. What you can afford goes hand-in-hand with the next section about RATES. You have to determine your rates in order to be able to provide a quote without sounding like you don't have a clue what you are doing. This is an area that is very difficult for most new photographers primarily because many new photographers seem to undervalue their own services. Whatever you do, don't find the lowest rates in town and start lower than that because you think it will get you business. Quality clients make decisions on more that just what you charge. FYI, there will likely always be someone cheaper. You cannot make a living at photography or buy new gear if you are not charging enough for what you do. The key is to NOT price yourself as the lowest priced photographer in town or on the other end, price yourself out of the market. So how do you establish rates? There are formulas and calculations you can make on overhead, etc. to come up with rates, but that's a completely different blog post within itself. So for now, I'll keep it simple. One key way is to find out what the market pricing is for a particular niche. Two more professional ways in doing that rather than calling a competitor which I think is unprofessional when posting as a perspective client are to look on local photographers websites for pricing which is not always there and the other way is to ask someone you know. Here's a real world example: I recently did a headshot of a dentist. His wife was looking for a family photographer, so I asked how the search was going. She told me that she had found prices from $150 to $700. She said that $350 seemed to be the middle price point and that she didn't want to go with the lowest or highest photographer. As a general rule, finding the mid-price point is a pretty solid initial place to be. I know because for the areas that I focus on, I seem to be middle to upper price point but rarely the absolute highest quote. This may not be the best formula, but it is a great beginning guideline. Don't get caught up on having a studio and letting it hold you back. There may be some barriers to not having a studio, but you have to look at the positive side of not having one. For example, if you do headshots, your selling point can be "I make it convenient. I bring the studio to you." You should write down all the potential advantages for clients of you not having a studio, but don't price yourself the lowest in the market even without a studio. Also, remember that although it's nice having a studio, it does add more overhead which means that you don't start making money from your studio until you get to the break even point of your monthly overhead which on a simple example means that paying out $1,000 per month for a space means that the first $1,000 of PROFIT simply covers your overhead. If and when the day comes that you make the leap to a studio outside of your home, start small and don't get into something that's going to add a lot of additional stress in your life. There's nothing wrong with having a goal of studio space, but don't let it hold you back. It's easy to get caught up in looking at other photographers work and losing confidence in your own work. 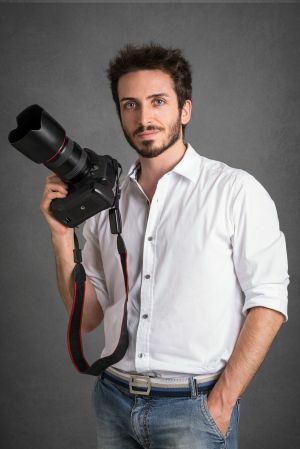 You do need to produce a quality end result if you profess to be a professional photographer, but you don't have to have a portfolio that matches your favorite photographer to start making money. Just like being confident will show through on the sales side and the shoot side when working with clients, lack of confidence will show through as well. Hold your head up and keep building your skills over time, but realize that every photographer has to start somewhere. If you are not thrilled with your current work, don't let that show by lack of confidence. Just continue to strive to be the photographer that you want to be without losing anymore sleep than necessary on your journey. Confidence makes life a little easier than a lack of confidence. If you try to do every type of photography known to man just because you need a dollar in your pocket, you will likely not be successful long term. You really should strive to find a market segment that you are passion about and be an awesome photographer in that niche. For example, if you choose to do weddings (very competitive market), you can also do engagement sessions and bridal sessions, but you can continue the relationship with your wedding clients as their family begins to grow by doing family photography as well. On the other hand, if someone asks you what type of photography you do and your response is "Any type of photography that will pay my bills" or "Weddings, Products, Nature, Commercial, Aerial, Headshots, Newborns, Architectural etc. etc. etc." Can you really be great at 15 different types of photography? Probably not. Therefore, find a 2 to 4 areas that may work well together that you love doing and go for it. Don't let not knowing what your niche is hold you back, but don't come out of the gate trying to do it all. Your backup plan could be to use a service that you can post your images on for free and forward your domain name to that site rather than give out the long free domain. You can even have a real working email with your domain when doing this option. The cost for registering the domain and all the set up necessary for email should be well under $100. This post is not about how to pull all of this off. It's more about encouraging you to not let things be a barrier. If you cannot have a self hosted site early on, there are numerous options for displaying your work online. If you have to have a long free domin initially, do what you have to do to move your business forward. Don't let not having a regular .com website and a regular domain email be a barrier. TAKE ACTION!!! DO THE BEST YOU CAN WITH WHAT YOU HAVE AND CAN AFFORD. THAT'S REALLY THE CORE OF THIS POST. Related Article: "12 Absolutely FREE Ways To Get Your Photography Business Going"
If you enjoyed this post, please "SHARE" using the social icons below. Sharing is caring!